Described as an explosion of warm, sweet and original rock, the members of 1 in Five have come together after time in other bands around Brighton to deliver Hold On, the band’s debut EP. From the big vocals and indulgent guitar in Something in The Water, to the lighter classic rock and tinkering of keys in Black Lake, the EP delivers a mix of sounds drawing on a range of influences. 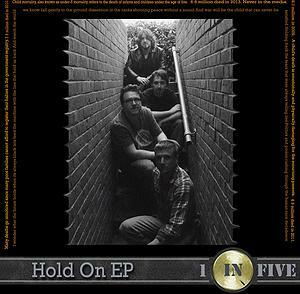 Lullaby reminds that song titles may not always align with how a song actually sounds, but be prepared for a tale of impending and imminent destruction in the EP’s title track Hold On.